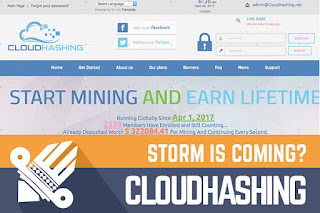 DavidNews HYIP blog - News & Reviews: Cloudhashing – storm is coming? 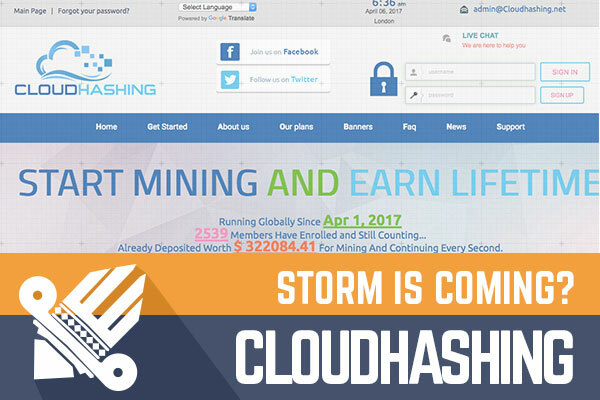 Cloudhashing – storm is coming? I haven’t forgotten about you, and I’m here to look at another HYIP project, which joined DavidNews.com Golden Stage listing four days ago. It’s called Cloudhashing. What does it mean? I have no idea but will try to find an answer by the end of this review. I have reinvested in this program $400 and will keep you updated on the progress of this HYIP on the following days/weeks. So, let’s start? First I thought to myself, where have I seen this. In the beginning, I wasn’t sure what I have already seen, but it hit me after a while. Cloudhashing logo creators most likely have been inspired from DigitalOcean logo. I guess the last wouldn’t be very happy to find it out. Most likely the reason why I couldn’t recognize it at the very beginning is that DigitialOcean has changed the logotype to the new version. You might ask, why am I wasting time and talking here about a logo? Well, it gives me an impression, which I must share with you here. Let’s not get too crazy and move on to other things. What is Cloudhashing going to do with all the deposits they receive from investors? The story doesn’t seem that obvious at the beginning. They claim that they are a multinational corporation, which was founded in February 2014 and it became one of the major leaders in the wholesale electricity. On the other hand, at the beginning of 2013, they decided to focus on solutions for miners. I mean, wholesale electricity sounds fine, but I must admit that the story is written in a way it’s hard to understand the direct connection between their success in the wholesale electricity market and BitCoin mining. Besides, you see that they were founded on 2014, but already on 2013, they decided to narrow their focus. At the end, I don’t understand if they do mining or they provide a cheaper source of electricity for miners. However, they claim that they are somehow related to mining. From their story, I assume they have legit company and registration details on the website. In fact, there must have been a mistake, or it is what it is. From the Cloudhashing about us text we already know that they have been running their successful business since 2014. However, their certificate of incorporation seems slightly different from other certificates I have seen on HYIP websites. I’m not talking even about the fact that the graphics in the image seem weird and have pixels around the text, but it has a lack of incorporation date in it. It might be a mistake, but why would you cut out such details if other certificates have it? Another strange thing is that the Companies House register website doesn’t have a company details for the company number, which is written in the certificate you can find on Cloudhashing website. The only thing I could find was some architectural company with similar company registration number, but extra 0 at the beginning of it. Another coincidence, right? I also did a quick read in forums about Cloudhashing and found some discussions, which shared a few findings common with mine. Moreover, I wasn’t the only one who is disappointed about the sloppy job on DigitalOcean logotype. I also noticed another interesting fact, which I missed myself – bonus after the first deposit. It might seem just a random marketing approach to you, but there are some folks in the industry that say it’s very suspicious. All HYIP’s offer interest rates and promise a revenue, which is calculated from deposit and interest rates. Why would you give some extra money for the first deposit and where do you get this money from? Too many rhetorical questions, but I realize that I’m not the only one who has many questions about this project. To be honest, there are already many dodgy facts, but it’s time to look at their investment plans. Cloudhashing is accepting deposits starting from as low as $5 and up to 25000, which I believe is an investment only for pro players in the HYIP industry. The interest rate is from 2.3% to 7.2% based on your investment. For large deposits, it is higher, while lower for small deposits. For example, $5 deposit has an interest rate of 2.3% but starting $3000 deposit interest rate is 7.2%. Basically, the interest rate will be changing only in deposit range from $5 to 3000$. After $3000 it stays 7.2%. I wanted to say that I like this approach because plans are easy to understand compared to other HYIP’s with 9 different plans with deposit included and deposit locked in, which makes it confusing. In this example, your deposit is locked in forever and will not be returned. Therefore, you must do the calculations, to understand when you have earned back the deposit made. To give you an example, $50 deposit has 2.7% interest rate, $500 has 3.2% and $5000 has 7.2%. We can’t compare the similar amount of the deposit, but we can compare different deposits for a similar time. For example, $50 investment for 15 days will make $20.25, which is not enough to cover even a half of the deposit. $500 for 15 days will make a $240, which is also not enough to cover a half of $500 deposit. However, $5000 deposit will make in 15 days $5400, which is already a $400 profit. It’s a big money and too much risk. Even though plans seem simple, pay attention to these calculations and do your own calculations, to understand how many days, it requires covering the deposit and start earning a money. I can’t remember writing such long review. In fact, I didn’t want to write it so long due to many suspicious things I have found during this review. However, I’m here to share my thoughts of different HYIP’s, and I must admit that there are too many strange things about this program. The quick and sloppy approach to the web design in combination with most likely fake registration details makes this HYIP look very bad in my eyes. Especially if we know the fact that company registration can be done remotely and costs only 100GBP. This altogether looks like a sloppy project with only one goal in mind. I mean all HYIP owners have this goal, but this one seems suspicious. Even though the interest rates seem high and may attract some potential investors, it’s extremely hard to predict when it all will end. Remember, always evaluate investment risk and invest money that you can afford to lose! Investment plans: 2.3% up to 7.2% daily for an unlimited term. Deposit locked in forever. Did you consider choosing the ultimate Bitcoin exchange service: YoBit.